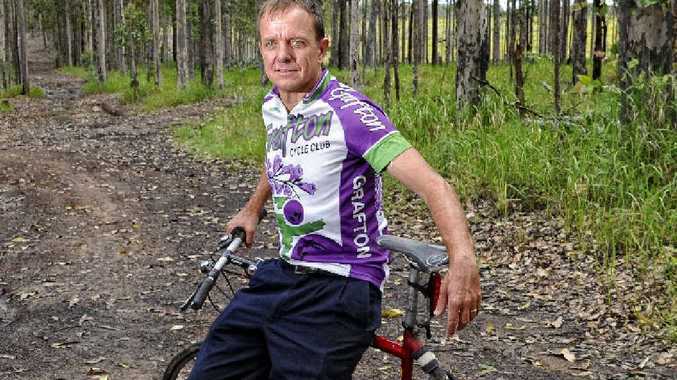 THE need for a helmet when riding your bike has taken on a new importance for members of the Grafton Cycle Club, who are concerned about shooters being set loose in the Bom Bom State Forest. The club built a mountain bike track through the forest, just south of Grafton, during the past three years and uses it for weekly races as well as regional events. Club secretary, Nigel Blake, is worried the fun may be about to come to an end with the forest scheduled to be opened to recreational shooters late in the year. A Game Council NSW spokeswoman said recreational shooters had been allowed to hunt feral animals in state forests since 2006. "Bom Bom State Forest is currently proposed to be declared for public land hunting," she said. "The declaration is continuing and an access plan is yet to be developed. Game Council will notify of the arrangements following declaration." She said hunters had to be approved by the Game Council and hold a gun licence or approval to use a compound bow, and compliance with the Game and Feral Animal Control Act was enforced by the Forestry Corporation of NSW, National Parks, the Wildlife Service and NSW Police. Member for Clarence Chris Gulaptis said the pest-control program, whereby recreational shooters did the work previously carried out by professionals, would save money. But Mr Blake said allowing shooting in the forest would be ludicrous. "We already have problems with illegal motorbike riders and reckless people driving four-wheel drives," he said. "Now we're going to have to contend with people with guns and bows." Mr Blake wrote to Mr Gulaptis asking the State Government to reconsider the policy. In 2012 the Game Council NSW issued a total of 15 penalty infringement notices and six warning letters to shooters in New South Wales who were found not complying with The Feral Animal Control Act.